There was rather worrying news from the regional conferences this weekend in which several parliamentarians, including Chief Whip Tom Brake, implied that the party would not vote against an Act of Parliament triggering Article 50 and/or repealing the European Communities Act 1972. I and many other members are increasingly concerned about this turn of events. Less than two months ago, we passed a policy at Conference that committed the party to remain inside the European Union. Our reputation for many years has been that of a Europhile party, and nearly all of our votes are aware of this fact. So too are the thousands of new members who joined after the referendum. To not vote against would not only be betraying party members, it would be betraying our voters too. After a bruising period in coalition in which we lost the trust of many of our members, I fear that retreating from our pro-European principles poses an existential threat to the party. Make no mistake, the expressed will of the party is to clearly oppose the triggering of Article 50. The government have a mandate to trigger Article 50, but we are evidently not bound to vote for such a motion, just like we are not bound to vote for other government pledges that we stand resolutely opposed to, such as the Snooper's Charter or the repeal of the Human Rights Act. 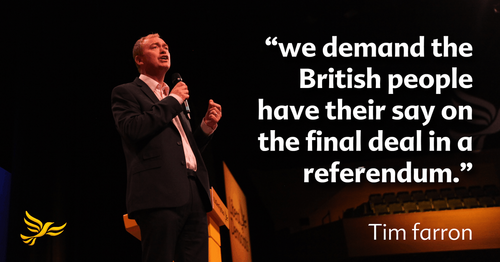 We must escape from this idea that the referendum result means the democratic process has ended. We have the right and the responsibility to scrutinise and oppose the Conservative Brexit plans, and we have the right and responsibility to not only believe that Brexit remains against the national interest, but to promote that idea and campaign upon it. Just because you lose a battle doesn't mean you stop fighting for what's right; just ask Labour how it worked out for them. We cannot afford to triangulate ourselves into bland centrism. We must stand up for our principles now more than ever. Already, there are dozens of party members who are so concerned that they have signed a request for a Special Conference to ask if our MPs to stick to the crystal clear policy we passed in Brighton: no to Article 50, no to Brexit. I'm calling upon the Parliamentary Parties to make their position on Article 50 clear so we can avoid this potentially expensive but necessary action. * Sarah Noble is an activist in Calderdale. Alongside her role on the LGBT+ Liberal Democrats executive, she shares a keen interest in devolution and transport policy.